And they come in so many varieties these days! chocolate, raspberry chocolate, white chocolate, cinnamon, orange chocolate, cranberry, strawberry, and that is not naming the slightly stranger exotic ones! Mmmmmmmmmmmmm – hot cross buns – of course, back in my day we had just the one standard variety – buns with sultanas, and that was all we needed. If you didn’t like dried fruit, No Buns For YOU, you were forced to slap down the same old boring dried toast for your easter Friday brekkie! I remember the day they introduced hot cross buns without sultanas……horrified silence………what was the world coming to? Why were they messing with all that was true and good in the world? 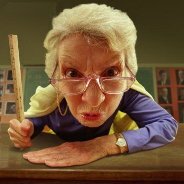 (Lordy – managed to channel my nan there for a moment, apologies readers!). Variety really does abound these days, catering for everyone’s wants (rather than needs). Want a licorice bun with durian swirl, sure! How about a mango bun with hotdog pieces….yum, sure to be on every craving pregnant woman’s list! 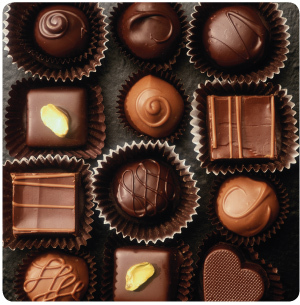 The first time I heard of chocolate with chilli – I thought the chocolatier had moved to insanity land. It isnt my fave thing, but it makes an interesting difference to have now and then. 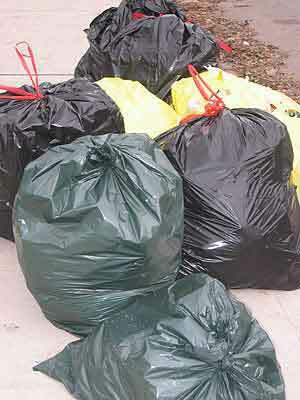 Sometimes I think the amount of variety in life can cloud judgement, I mean, how many types of rubbish bags do you really need in life? Coloured, Scented, with or without handles, no seams, seams, reinforced, with a automatic dispenser to send deliver puffs of your fave designer perfume wafting around the room when you open the bin (joking, but dont bother rushing to the patents office, I just patented it myself) . These bags are hidden away, they just collect the trash – do we really need designer options? Then again, if consumers dont have choice very bad things can happen, the Coca Cola Company can tell you all about that with new coke…….wasnt that a debacle. 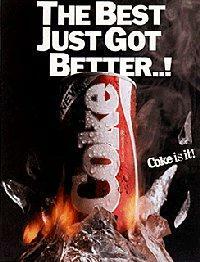 Coke’s biggest ever marketing failure, based on telling consumers what they wanted rather than letting them choose. Lessoned learnt by Coke – let the people choose (but not for Presidents – that truly is the role of big biz and their money to decide). Back to variety – Sunday is Happy Easter Egg Day according to Ms Bethie Boo. She is very excited, this is her big discovery of the easter bunny. And what a treasure trove he is hauling! Chocky eggs, bunnies, bilbies, chicks, dinosaur eggs, cars, cartoon characters, and then we start looking at all the value add sets – egg with barbie, egg with Dora, egg with Ben Ten, and I have not started on the adult eggs (Lindt, Ferrero….yummmm)….. Hope the bunny meister has been working out at the gym! 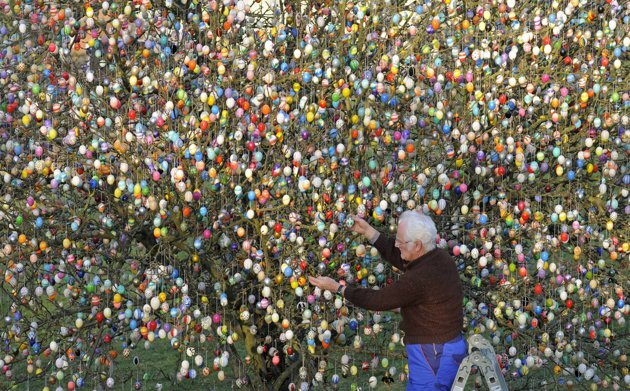 German Volker Kraft decorates a tree with 10,000 Easter eggs in his garden. They began decorating their tree for Easter in 1965 when they started with 18 individual eggs. Pretty cool, although I am imagining a bit of interest from local rodents and insects that might be less cool! Well – I am off to eat come more rare peruvian mustard infused hot cross buns, and to decorate a tree. Talk again on Chocky Sunday!